A charming collection of traditional cream and pine storage furniture for the bedroom. 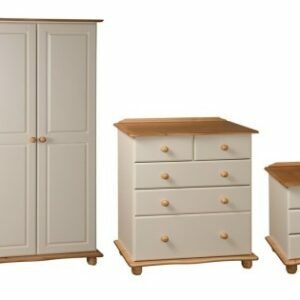 Solve you storage woes in style with the versatile Coventry Bedroom Furniture Set in Cream and Pine. A beautifully crafted selection of traditional solid pine furniture in a charming cream and natural stained lacquer finish. The bedside will comfortably hold the bits you need close at hand while the two plus three drawer deep chest is ideal for anything from folding clothes to spare linen and towels. Finishing off the collection is a large two door wardrobe to ensure your hanging clothes can be stored safely without creasing.